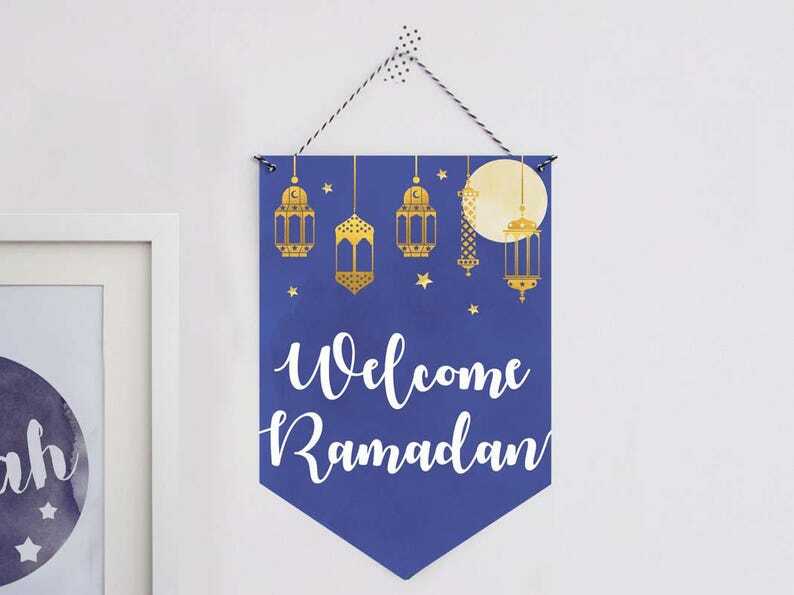 This Welcome Ramadan paper decoration is a simple printable banner that is a fun and unique wall hanging to display in your home throughout this special month. Made from watercolour textures and gold foil effect lantern illustrations. NO PHYSICAL PRODUCTS WILL BE SHIPPED this is a digital file only. These are PIY (Print it yourself) files. Just print (at home or a high street printers) cut either by hand or with a paper guillotine. Use a hole punch to make the holes either side of the banner then tie bakers twine/string to display. Jazāk Allāhu Khayran - "May Allah reward you with goodness." Please note: This is a listing for x1 printable banner ONLY the other listing images can be purchased separately via the links below. Once you have completed your order the digital print files will be sent via a download link to the email address you have provided on your Etsy account. - There will be no water marks on the final artwork. ♥ What are your T&C's? You can use my designs on personal or non-profit projects without credit as long as NO MONEY is being made. IMPORTANT: All of my prints are for your personal use only and cannot be used for commercial use or for resale in any way. Original artwork is the intellectual property of Amal Design. COMMERCIAL: If you would like to use them as other products (commercially) other than prints, please get in touch first to discuss licence options. ► Contact me with any questions: https://www.etsy.com/uk/conversations/new? Thank you very much for using Amal Design for your projects, I hope you enjoy using them and I here to answer any questions you might have. Added an instant decorative and welcoming touch! very happy! will order again! It's lovely, if only the little hole templates were slightly bigger but apart from that it's fab! Where is my donation going to? What can I do with my digital download? There are many options for using your digital download! You can make your own wall art prints, greeting cards, invitations, tags, notebooks, planner stickers and lots more. Where can I get my digital files printed? If you are printing at a shop just pop your digital files onto to a USB stick or email to them before hand.